So if religion is the Opiat of the people then certainly Politics is the Crack- Cocaine for the masses. It makes us crazy and bitter and we go about irrational with that hollow look in our eyes. I am heart sick that my Green Party is little more than a Demacratic little sister who is shooed away and told to go play outside while the GOP and the Dems sit around and decide just which Corporations will gut the people and sap our resources and destroy our environment. They are all the same and the Socialists and Communist are no better. Leaders that are corrupt or corruptable and filled with self serving rightousness and predjudice. To say any one party is better than the other equates to saying one religion is the true ideology and only they can commune with God. You know for sure when there is no truth when someone tells you “theirs” is the only one and true path. Religion or Politics. There is certainly truth but I do not believe she has revealed herself to the masses as of yet. Science nope, family – sometimes. Nature – cruel and severe in her own way. So where is the truth? And how can we declare that ours is the way without being caught in the trap of 42 or 23 or even 13. For me every question can be answered by Pie. More later on that. I think a lot about politics. I come from a Military family except for my parents who were both Hippie Merchants rebelling against their career military fathers and grandfathers. I was talked out of joining the Air Force at 18 and went to University to study Art History instead. I was a professional student then for seven years, putting myself through school working full time and wishing I had joined the Air Force, Army or the Coast Guard. Life being a big “What If” I am happy with my chosen path and fight now for the Environment rather than the industrial corporate machine that has become the “Leadership” of our country. I support every soldier and their families in their choices to serve and I honor the sacrifices they personally must make every day. Brave men and women. I do not appreciate them (our soldiers) being treated like puppets or cattle, I think it an abhorent lack of manners the lack of supplies and technology that they suffer in the field. The greed and arrogance of the American leaders in not giving the soldiers State of the Art protections and support makes me ill. – Semi armored vehicles and limited ammunition supplies- old technology. Where are the lasers and the droids and the remote viewers? We are still in the dark ages. Why have War at all? The planets resources are dwindling and time is running out. There is something more in these wars then the leadership wants to tell the American people. 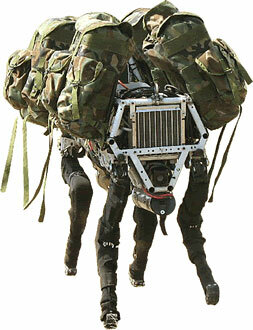 In reality soldier’s jobs could in ten years be replaced by robots. 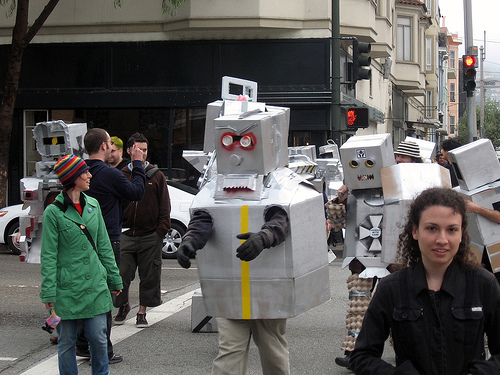 That being said the humanity – the social aspects – of rebuilding the countries and territories that have been devastated by war could not be built back up with robots (not yet). I honor the humanity and the spirit of peace that many soldiers try and achieve. They are treated poorly and their families suffer with substandard pay and health care. They risk losing limbs and their minds – their very souls to the machine. If nothing else they should be secure knowing their service would guarantee their families financial security. I am tried of politics and in my quiet moments I dream of a time when we have no war and no politicians and everyone (in the world) has everything they need and all are happy and well. No more extinctions. The Architect in the Matrix however says this senario never works. I would take this really serious if it were solar, or bio-dynamic and not a gas engine. Previous Death Defying Acts Next Answer of sorts.